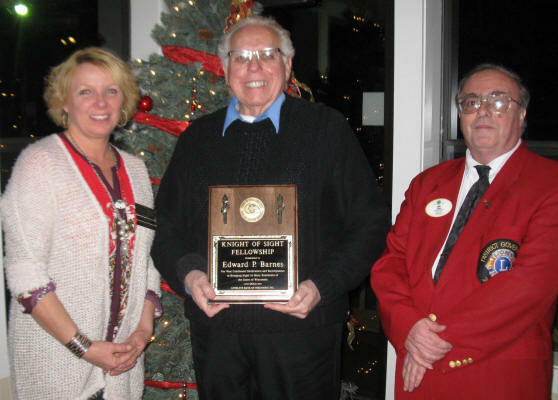 Edward P. Barnes received the prestigious Knight of Sight fellowship at the Fond du Lac Evening Lions and Lioness Christmas Party. The Knight of Sight Fellowship was presented to Ed by the club for his continued support of club activities, fund raisers and participating as a Lions Eye Bank Tissue Transporter. A Knight of Sight Fellowship is awarded by the Lions Eye Bank of Wisconsin upon receipt of a $1,000 donation by a club or an individual to the Eye Bank's operating fund. Ed has been a member of the Fond du Lac Evening Lions Clubs for 18 years and has served as president of the club. Lions from all over the state volunteer their time and automobiles to transport donated eye tissue down to the eye bank in Madison for processing. The corneas are then transported by Lions back to doctors throughout the state for transplantation. Other FDL Evening Lions that are Knight of Sight Fellows are Wayne Bargenquast, Frank Bartzen, Betty Clausen, Tom Clausen, Gary Colton and Erv Karls. Pictured are Cindy Rank, Lioness Affiliate President and member of the Van Dyne Lioness Club, Ed Barnes and District Governor, Gary Silah, also a member of the Fond du Lac Evening Lions Club. Rank is a volunteer Eye Tissue Transporter for the Lions Eye Bank of Wisconsin.